I Am Curious (Yellow) was a 1967 Swedish film written and directed by Vilgot Sjöman. It held cult status amongst movie goers for many years. The Beatles “Yellow Submarine” was both a movie, soundtrack and recording. Also in the ’60s was Donovan’s song – “Mellow Yellow“. So, it is not uncommon to think of yellow as part of our everyday existence. So, why back in 1980, was the Ron Robertson-Swann steel plate sculpture he called “The Vault,” so despised? Its allocation on prime city turf, on the ‘city square’ and modern appearance in the early 80s; aggravated the city-folk so much – they nick-named it the “Yellow Peril”. Regardless of the fact that Swann had studied under the British sculptor Henry Moore; the launch of his piece was considered far too abstract for public taste. Subsequently, ‘The Vault’ moved a few times around town, and became scrawled with graffiti; and ultimately used as both a play structure, skateboard ramp and shelter for the homeless. Its third and final move has placed it in ‘dormancy’ and out of controversial criticism. At this resting place, may she remain ‘mellow yellow’. 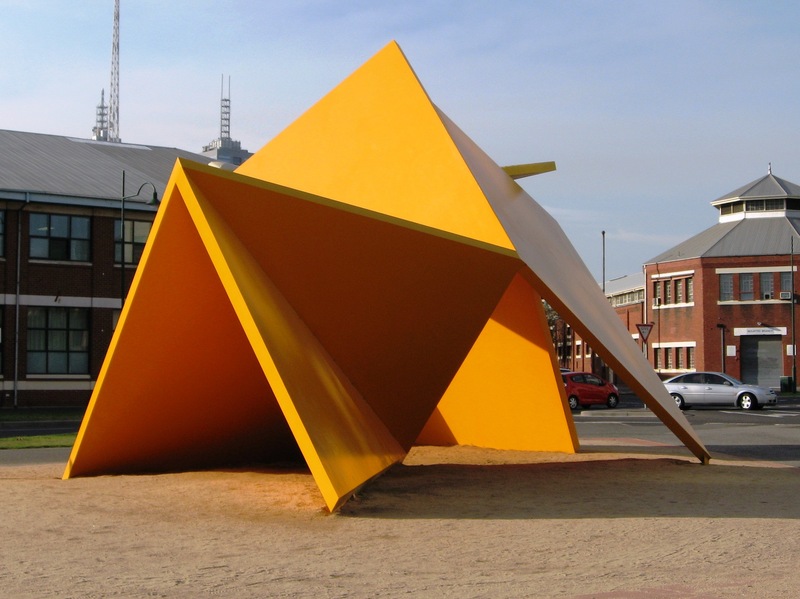 This entry was posted in StreetFurniture and tagged Robertson-Swann, The Vault, Yellow Peril. Bookmark the permalink.